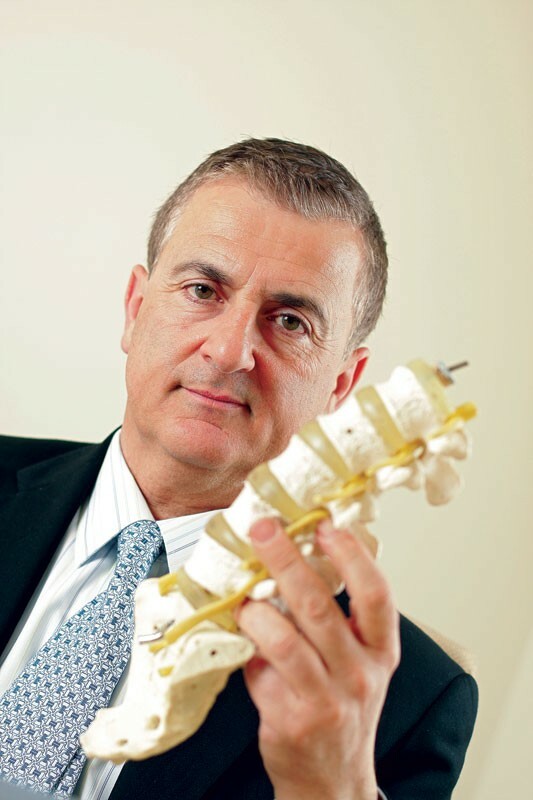 Orthopedic surgeon Antoine Tohmeh is testing new methods for lower back surgery. Fifteen years ago, treating degenerative disc disease through surgery was difficult and painful, leaving patients in the hospital for five days, with a long scar that roughly traced the spine. But if the work of local orthopedic surgeon Antoine Tohmeh makes it through arduous clinical trials, all of that could change. Tohmeh is one of 17 surgeons testing a new product from Nuvasive called “extreme lateral total disc replacement,” or XL TDR. Though Tohmeh has performed the surgery on 20 patients locally — and the entire trial has used the new technology on 160 people — the innovative new technique won’t reach the market for years, because of the slow, deliberative pace instituted by the U.S. Food and Drug Administration as part of the trial. “It’s the advent of technology. That’s what enables us to do this,” says Tohmeh, who has practiced with Northwest Orthopaedic Specialists since 2009. “I can tell you with great confidence the surgery will be much cheaper. “This is the only surgery center approved to do this in Washington,” Tohmeh adds of the clinic’s Orthopaedic Surgery Center. Mirna, his assistant and wife, reminds him it’s not the clinic that was approved, but him. “You are the only surgeon in Washington allowed to do this,” she says. Regardless, Tohmeh is certain that the technology will make treating disc degeneration through surgery much more accessible for people. Pain will be lessened and the cost will go down. Not only that, but patients will undoubtedly find it a much easier surgery. Tohmeh usually starts the procedure at 8:30 am and sends the patient walking out at noon. Sitting in a fluorescent-lit conference room of Holy Family Hospital, Dr. Tohmeh explains the mechanics of the spine, and offers a brief history of the recent rapid evolution of back surgery. Before him stand three translucent sections of erect spinal columns. Most everyone knows the spine is made up of a stack of bones called vertebra, and interspersed between the vertebrae are spongy discs. The spinal column has a variety of function, including supporting the weight of the upper body and allowing movement. It also provides a safe passage — in the form of a bony canal — for the precious spinal cord. Along the sides of the vertebrae, a series of nerves exits to innervate the body. The anatomy is complex and vital; performing surgery on it is a challenge. And surprisingly common. As people age or with injury, the discs between vertebrae can lose their resiliency and become deformed. The results? Pain, weird sensations, numbness and sometimes muscle weakness in the affected zones. Into the 1990s, treating this degeneration meant spinal fusion. By essentially gluing vertebrae together, motion — and therefore pain caused by motion — was eliminated. Surgeons approached the area from the back, which meant going through the back muscles. “With the advent of more knowledge about spines, people began moving away from [the] rigidity” that other forms of lower back surgery left in their wake, Tohmeh says. In the mid ’90s, “cage rage” hit, says Tohmeh. It was cutting edge technology: A hollow “cage” was put between vertebrae to restore lost disc space, relieving pressure on the nerves. Movement was preserved, and orthopedic surgeons raved. There was a downside, though. Instead of making incisions through the back of the spine, the cages had to be inserted through the front. Though the new approach avoided traumatizing back muscles, it required cutting the important spine stabilizer known as the anterior longitudinal ligament (ALL), which created its own set of problems. In 2004, like many surgeons across the country, Tohmeh started doing minimally invasive surgeries that used an incision through the patient’s side, avoiding both cutting the back muscles and severing the ALL. It was another leap in spinal surgery technology. But the surgery, called XLIF, required rods and screws to surround vertebrae like a clamp, and it limited mobility. In 2008, Claire Utley came to see Tohmeh. Utley, who was then 23, had already had two microdiscectomies, a procedure where small bits of vertebra are shaved off to relieve pressure. The surgeries hadn’t worked for Utley. Still, Tohmeh didn’t rush into trying the new procedure. After nothing worked, Tohmeh took his scalpel to her side, leaving two, half-inch incision marks and a partially fused spine. Soon she was walking four-mile loops on Spokane’s South Hill. Then she was running. Then she competed in triathlons. Finally, 15 months after surgery, she completed the Ford Ironman Coeur d’Alene. “It was a very, very innovative technology, very cutting edge,” Utley says of XLIF. And though this was just three years ago, and Tohmeh was using the most cutting edge techniques, he’s moved on to even more innovative practices. Which brings Tohmeh to XL TDR in his brief history of spinal surgery. Brandishing a tiny collection of vertebrae, he points to the even more innovative technology he’s currently helping guide through the grueling FDA process. With the new technique, two small metal plates with ball and socket articulation are inserted in place of a degenerated disc. This, Tohmeh says, allows for all six ranges of motion, unlike the older technologies. “We call it the six degrees of freedom,” Tohmeh says. Though the FDA anticipates the trial taking until July 2012, Pairamore is sure it won’t.